VOGONS • View topic - Tube Time: Announcing The Snark Barker, a 100% Compatible SB 1.0 Replica! Tube Time: Announcing The Snark Barker, a 100% Compatible SB 1.0 Replica! Re: Tube Time: Announcing The Snark Barker, a 100% Compatible SB 1.0 Replica! The DAC came from another seller, and it arrived two weeks ago. 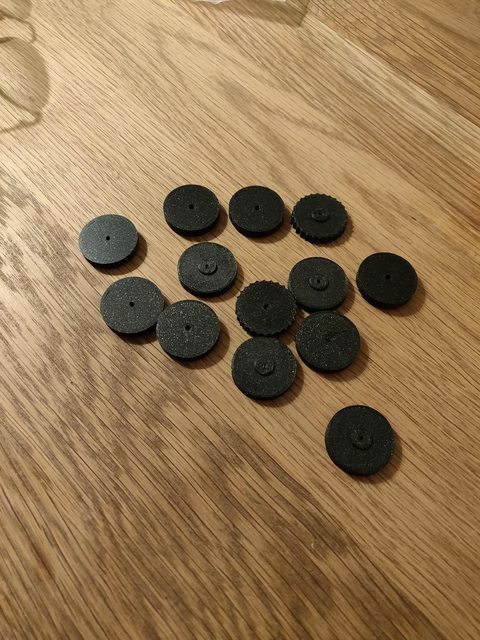 Some volume knobs arrived today, my brother printed them. They're black, with glitter because he has a sense of humour (and I think thats what he had available at the moment). It wasn't a very high-res printer, so there are two knobs with a more ridged design (giggity). They look good! I think the extra ridges are a good idea. I have the standard STL, and it is quite slippery. root42 wrote: They look good! I think the extra ridges are a good idea. I have the standard STL, and it is quite slippery. I'm looking for a screw now. There are large boxes on eBay/Aliexpress but that takes forever to get here and I would have to buy 1000 screws to get one I need local hardware stores don't stock it. Yes that one will fit. I took one with a conical head, but the flat head should be fine. Maybe for the meantime I will make an STL file for printing, as a stopgap measure. root42 wrote: Yes that one will fit. I took one with a conical head, but the flat head should be fine. EDIT: It's problably way smarter to find a local company that can (laser)cut metal. But yeah, there are a couple of companies that could make the exact bracket. Cost will probably in the order of 10 EUR per bracket for a small batch (you probably won't find any company doing batches less than 100). Last edited by root42 on 2019-3-28 @ 15:19, edited 1 time in total. root42 wrote: Almost the right one"
Huh, did not find that one, I did not do the search for 3 rond holes. It's dated 1993, So it's probably another ISA sound card. Really cool they have it all available online. NE558, YM3812 and SAA1099 arrived today Little screws should arrive tomorrow, and then it's just the bracket. Not tested it yet! On a similar note: Would it be possible to mod this one or to mount the potentiometer on a piece of perfboard behind the third round hole? It looks like a bracket for a PCI Sound Blaster card. Could someone take a look at the datasheet and compare the hole placements? i wasn't visiting Vogons for this Year - Shame on me - and an Friend told me for that Snark Barker here, ..
Where did you get the Micro8088 PCB? I do have a couple of V20s and Faraday ICs, but wouldn't want to order 10 PCBs again. Got my card working after a fashion this weekend. 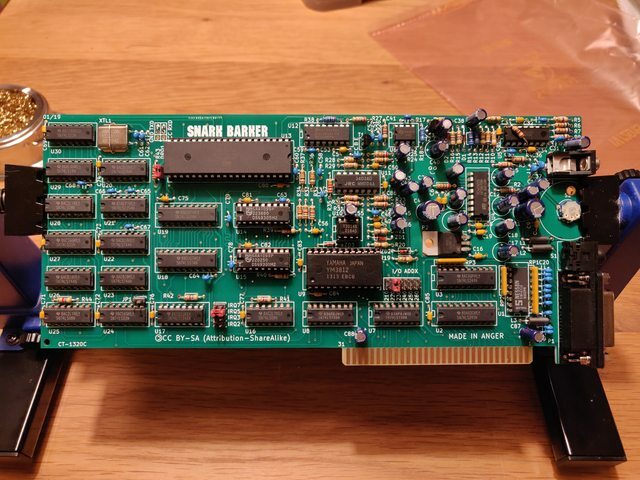 I discovered that the DB-15 sockets I had were male rather than female so I desoldered the second DB-15 from a dedicated game port card I had. I also socketed that cards NE558 so I could use it. I managed to use an audio socket from a scrapped PC by cutting off two of the legs as well. I still do not have the opamp for the OPL chip but I was super happy when Wolf3d picked up the card and blasted that door opening sample through my speakers when I started playing. CMS sound does not go though the same opamp as the OPL - and works properly. In fact a lot less noisy than the MUS-1099 card I built recently. My CH Flightstick works fine with the joystick port - tested it a bit in Descent and TIE Fighter. Most games with auto-detect routines seem to pick the card up. Also played a few early demos like Crystal Dream and they sound decent as well. Very chuffed with this card.